It dances through the day, full of impressions and impulses, empty of thought or care. Something moving near it casts a shadow on its sight, and it darts away without knowing why, startled but not frightened. A rival passes and it dashes at him, powerless to hurt, but bursting with nervous energy which must find an outlet, and the two in mock combat mount up into the sky until they are lost to sight. The month of February is drier than January but wetter than March, and much more bearable than the searing May. In the forests of the Sahyadri, rivers shrivel to a trickle or stagnate in small puddles. Streams burry into the ground and lakes shrink to their halves, and slowly they all expose their moistened shores and damp beds. These ecotones, lasting for over two months, serve as an important ecosystem for a myriad of life-forms. It is a place of a gathering for animals large and small, as they home in to relish this ephemeral reserve at their stipulated times. A walk in the forests of the Sahyadris is refreshing at any time of the year . With leaves falling all around you, the silence of the forests is only broken by a singing bird. And as the leaves break from the last strand of cellulose holding onto the branch, they float soundlessly in the still air before spiraling down to the forest floor. The trees are taking no chances of losing precious water through transpiration. The clamour of insects has been silenced, save a lone cicada, or a butterfly, which are making the best out of the scant undergrowth. The forest may seem empty, but it is not. They all have converged into the last remaining waterholes. There are birds that dive into the puddles early in the morning – Tickel’s Blue, Red-breasted and Paradise Flycatchers, Purple Sunbirds and Booted Warblers – to bathe in its cool waters. As the air warms, the birds fly into the canopy and catch insects or sip the sweet nectar of Bombax ceiba. But it is not only the birds that make the best out of it. There are also mammals that come in the cover of the darkness, unseen to the eye, forgetfully leaving behind their footprints in the soft banks. And then there are those of the other kind with three pairs of feet, and wings bejeweled with scales of myriad shades. Aitken, in his exceptional essay On the Prowl, made a very close analysis of a butterfly from the eyes of a wanderer. He saw through its eyes a world we cannot fathom: a simplest of the worlds – where a butterfly is for the world as much as the world is for a butterfly – small but whole. As I lay by the bank of a drying stream looking into their eyes – they appeared cautious but not afraid. With their proboscis they were lapping the moisture, minerals and salts from the streambed, and fluttered around haphazardly, but not mindlessly. They’re not mindless. No organism that has a sense of time and direction is mindless. In Yeoor, these butterflies bask in the sun as the sun rises from behind the tall mountain in the east. As the clock hits 8 AM, their fluttering becomes apparent, and by the time the sun is one-third its way in the sky, they’re out and about feasting on flowers and chasing mates. In February, they’re mostly devoted on extracting water, minerals and salts from damp sources; this behaviour is referred as mud-puddling. During this season, you will see butterflies in their hundreds – or maybe in their thousands – congregating and sipping away until the end of the day. In India, they generally do so prior to the onset of monsoon, from the months of February to April, and in the foothills of the Himalayas or the rainforests of the south where water is plenty, they do so in May as well. In the drier regions, as in the deciduous ecosystems of the northern Western Ghats, they do so only in the period of February-March and during June. Yeoor Hills, and other corners of the forests abound the Sahyadri, hide little secret water reserves in the dry seasons. They have been serving as the last source of water for years, perhaps ages, and like the birds, butterflies know it well. How and when they realize that it is the time for mud-puddling, I can only wonder. It is obviously built into their genome, but do they remember the location and pass it into the genome of their offspring, or does every butterfly seek it in the vast reaches of the long ranges, I do not know. All I can do is marvel at these ingenious little creatures and their rather great adventures, ironically, having evolved into one of the most delicate, if not defenseless, of all the organisms on our planet. Butterflies of all families mud-puddle: Papilionidae, Nymphalidae, Pieridae, Lycaenidae and Hesperiidae – the representative families in the Sahyadri, seek the cool, moist lips of the lakes and the rivers, setting them ablaze with their brilliant shades – whites, yellows and reds, and, often a flickering of the dazzling blue. Day-flying moths in the family Arctiidae and Geometridae make sure to visit these little havens as well. 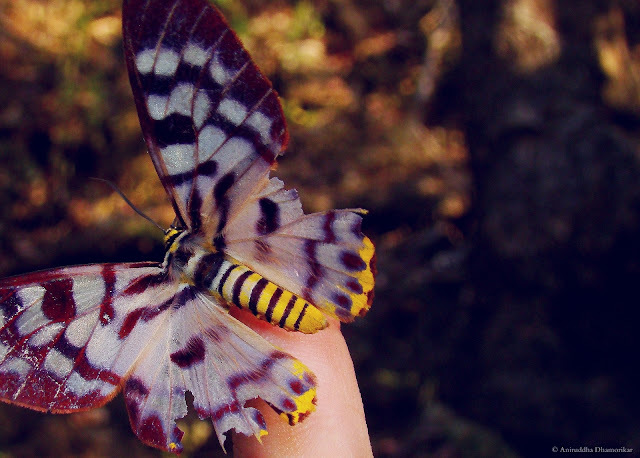 One of the most beautiful of the moths, the Dysphania, is a faerie of the woodlands. Fluttering her wings, she sails in the stillness of the forest air, soaring and plunging with ease. She settles along a stagnant pool and unfurls her long proboscis. Not all lepidopterans are so elegant in their flights, however. Some appear out of nowhere, in a blink, and disappear as soon as they arrive. Yet others linger on until the end of the day. The most abundant of all the families at mud-puddling sites are the Blues (family Lycaenidae). It is only during this season that one may glimpse the sheer diversity of these azure little flutterers. From the exceptionally small Lineblues, to silver-studded Silverlines, sapphire-coloured Dark Ceruleans and Oakblues, and luminous Red Flash’s and Cornelians, they are a treat for sore eyes, and this season offers a great chance to observe them until next year. Many of the Swallowtails (family Papilionidae), such as the Tailed Jays, Blue Bottles and Spot Swordtails, all flutter down for a sip, but they rarely ever sit in one place. Their hyperactivity keeps them from settling down; instead they flutter about, barely touching the ground with their feet. The Danaines in family Nymphalidae, such as Striped Tigers, Blue Tigers and Common Crows, and their mimics, the Danaid and Great Eggfly’s, are also drawn to this funfair. It is not always that you see them congregating in great numbers, or in such a diversity. Like the flocking of the migratory waterfowls and cranes, which takes place due to various climatic and geographic factors, the congregation of butterflies is one of the most complex and magnificent natural phenomena worth experiencing. ... loved every bit of the essay ... every bit gripping.